Sydney Park this April played host to BioBlitz, a citizen science festival aimed at uncovering and celebrating the growing natural diversity in the city’s backyard. Organised by the City of Sydney over two days, 21 different activities such as spotlight surveys, bike tours and a barbecue were held. Over 300 community members participated. 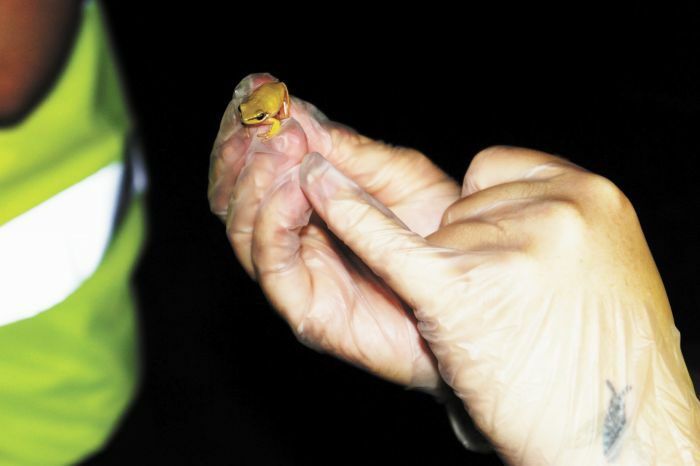 Scientists accompanied small groups donned with head torches looking for frogs, insects and nocturnal wildlife including microbats and birds of prey. Daytime activities included a check of the park’s nest-boxes, surveys of waterbirds, fungi and reptiles, an Aboriginal cultural tour and a botanical drawing workshop. In the frog survey, expert Josie Stokes led a group along the cascades down to the wetlands where a variety of frog calls were heard. Many people mistake crickets for frogs but Josie explained that crickets usually chirp continuously whereas frogs call over separated intervals. Before the survey, participants were encouraged to download the Australian Museum’s FrogID app which contains details and calls of Australia’s over 240 different types of frogs. The app allows users to record and upload frog calls that are later identified by experts. The data is assisting scientists to learn more about how different frog species are responding to a changing environment. The information could be crucial in saving Australia’s frogs, four species of which have become extinct in recent years, with many more endangered. Previously, five different varieties of frogs have been spotted in Sydney Park, but the BioBlitz this year spotted only three. Josie was able to identify two of them by their call alone. As the tour came to an end, though, she was able to briefly capture and release an Eastern Dwarf Tree Frog (Litoria fallax) sitting on a reed. The adults and children were delighted to see the delicate creature. Fiona, aged 9, said she had never seen a wild frog in Sydney before. The endangered Green and Golden Bell Frogs in nearby Arncliffe had recently been in the news as their habitat was adversely affected by the construction of WestConnex. The motorway also destroyed a significant portion of Sydney Park, despite sustained opposition from locals who camped out for over a year. The effect on wildlife of the imminent construction of 400 apartments adjacent to the wetlands is also yet to be seen. Another part of the survey was led by medical entomologist Dr Cameron Webb. He laid a series of carbon dioxide mosquito traps through the park that helped identify 14 species of mosquitoes, midges and spiders. His research is used in public health to understand and warn about the spread of mosquito borne diseases. In all, the BioBlitz recorded 133 species. The data will form a baseline for future comparison and give a better understanding of how the park’s biodiversity is tracking. For more information and images of all the species in detail, check out the iNaturalist website.